In Thailand, we also use Chineses Lunar Calender. The Chinese calendar determines the day that a year assumes the name of the next animal in the twelve-year animal cycle; so by this system, year names are repeated every 12 years. People who were born in each of those years will have certain characteristics of those animals. Legend has it that on the Buddha last day on this Earth he invited all the animals but only 12 came, so to reward them he named a year after each of the twelve. 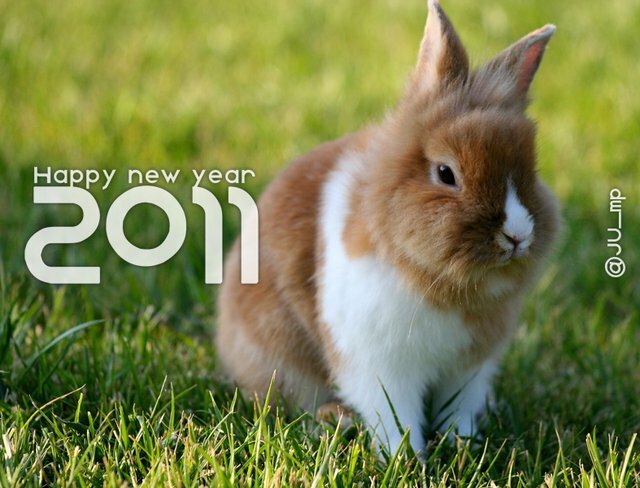 The Year of the Rabbit will begin on 3rd February 2011 and close on the 22nd January 2012. The Rabbit is the 4th animal in the Thai Zodiac. The Year of the Rabbit will be much appreciated following the somewhat tempestuous Year of the Tiger and will bring a much needed period of calm. The tiger year of 2010 has been a year full of riots, chaos and natural disasters in Thailand, but as the wild beast retreats to his cave, Thais are given a shimmer of hope with the appearance of the rabbit in 2011. So many are excited to greet the year of the rabbit, where the animal’s calm nature and quick ability to breed is expected to bring about peace and prosperity. The appearance of the delicate creature, soothsayers predict calm and serenity will fill the kingdom. The Year of the Rabbit is known in Thailand as Bpii Tor (ปีเถาะ) or Bpii Grataai (ปีกระต่าย) . Thais also believe that everyone should make a pilgimage at least once in their lifetime to the temple associated with their birth year. I was born in the Year of the Rat.Temple associated with the year of the Rat is Wat Phrataht Sri Jomtong, Chiang Mai. Which animal is associated with your birth year?